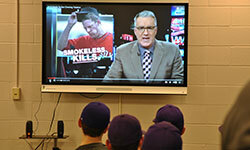 The use of tobacco – especially chewing tobacco – has been a part of baseball culture for many decades. In the “old days” players were even seen with cigarettes and chewing tobacco on the playing field. Times have changed. Now, tobacco use is clearly linked to serious illness and death from cancer. 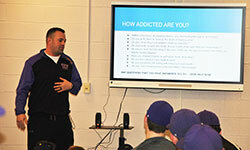 In an effort to educate WVCSD scholastic baseball players about the cancer-causing health effects of using smokeless tobacco, an informational presentation was held for Warwick High School and Middle School Varsity, Jr. 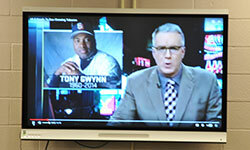 Varsity and Modified baseball players on March 29 in the WVHS Media Center. 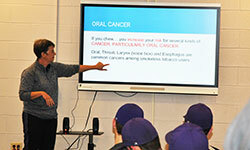 After an introduction by Coach Sirico, student-athletes viewed a video about the late Major League baseball player, Tony Gwynn, whose death was the result of oral cancer caused by years of using chewing tobacco, also known as smokeless tobacco. 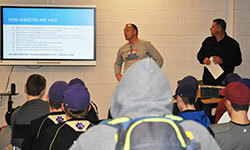 Each coach emphasized the same important message for the student-athletes: the smartest way to avoid these health dangers is to not start using chewing tobacco – and if you already chew it, quit as soon as possible. Now that the harmful effects of tobacco use are well known and documented, some new regulations in the world of baseball have been put into place. 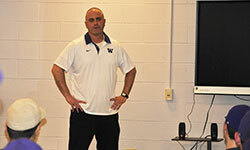 The session concluded with information from the WVCSD Code of Conduct about the penalties – including suspension from school – of tobacco or chewing tobacco use on school property or while participating in school athletics.